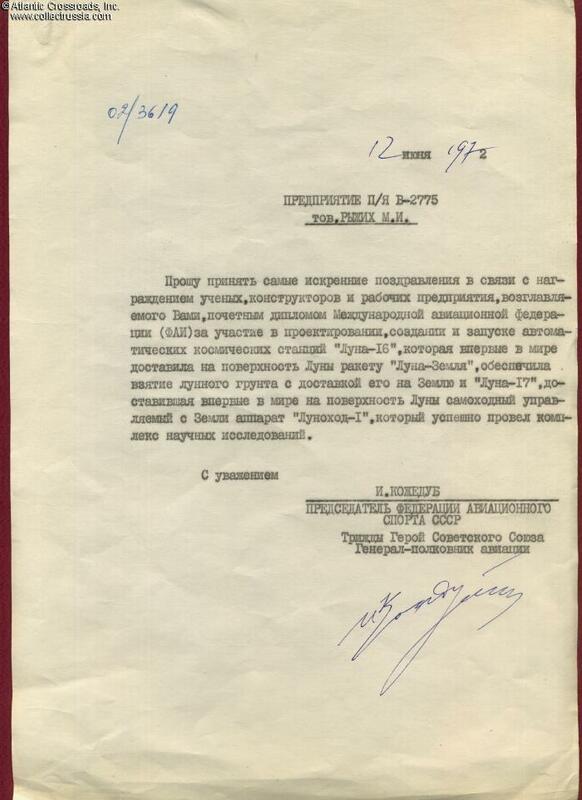 Air Force Colonel General, Three Time Hero of the Soviet Union Ivan Kozhedub, letter signed, 12 June 1972. A rare historic document signed by the WWII Allied "Ace of Aces". Single page, single sided, 21 x 30 cm format. Kozhedub boldly signed in ballpoint pen near the bottom as Chairman of the Federation of Aeronautical Sports of the USSR. This letter of achievement is addressed to M.I. Ryzhikh, the Director of a Top Secret organization only designated as Postal Box V-2775. Kozhedub congratulates Bugayskiy with his and his organization's participation in the creation of the Luna 16 automatic spacecraft which had performed the first roundtrip flight to the Moon and delivered samples of lunar material to Earth, and the Luna 17 spacecraft which had landed "Lunakhod 1", the world's first moonrover. The letter is in very good condition. Shows minor wrinkles along the edges, the corners are slightly crumpled. There are no tears or stains. This document will look great when properly framed. Ivan Kozhedub was one of only two Soviet fighter pilots to be awarded the Gold Star of a Hero of the Soviet Union three times during World War II (the other was Aleksandr Pokryshkin, with 59 victories). Kept from the front lines due to his great skill as a pilot instructor, Kozhedub did not fly his first combat mission until March 26, 1943. On April 19, 1945, he downed two Focke-Wulf Fw-190s to bring his final tally to 62--the top Allied ace of the war. Kozhedub is associated with a single fighter type, the series of radial engine, wooden aircraft designed by Semyen Lavochkin. The last of them, La-7 No. 27, survives at the Monino Air Museum near Moscow. 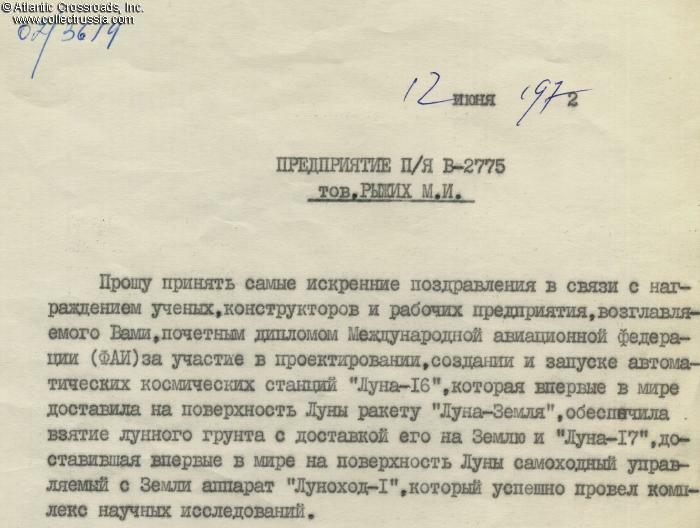 Incidentally, it was none other than Lavochkin design bureau that decades later created the Luna spacecraft referred to in the Kozhedub's letter. In 1949, he finished the Zhukovski Military Aviation Academy. During the Korean Conflict, he commanded an Air Regiment that was heavily engaged against U.S. fighter aircraft. In 1956, he graduated from the High Command´s Academy, after which he was promoted to General and served as a senior member of the Air Force Staff, finishing his career as Marshal and General Inspector of the Soviet Air Forces. Ivan Kozhedub passed away in August 1991 but remains a popular icon of Soviet Military Aviation history. 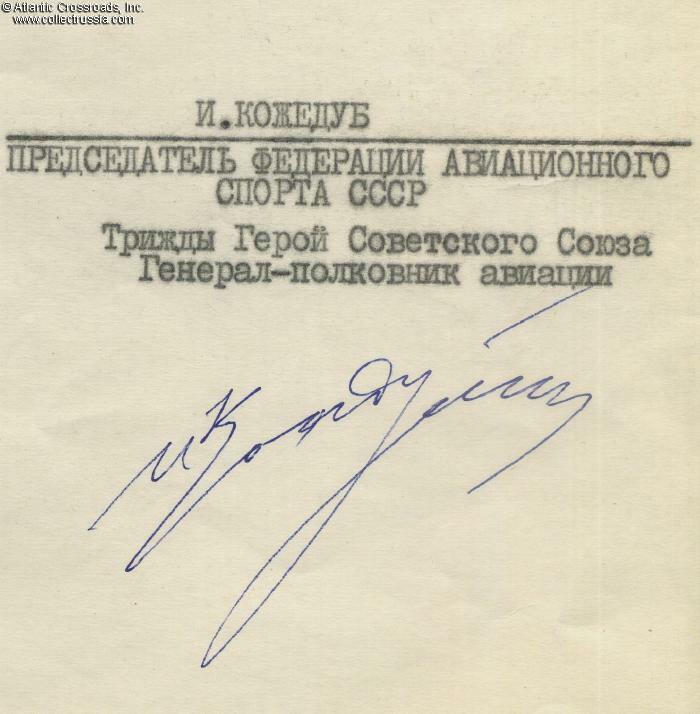 This document is of course particularly interesting not only as his autograph but also because of its connection to Soviet space program.